While Retained Logic and Progress override are the two options available in P6 which enable the scheduler to analyse in different scenarios, each option has advantages and disadvantages. It produces the most realistic schedule if the levels of detailed information are available and schedule logic were design appropriately. It maintains all predecessor relationship and will not allow the remaining portion of an in-progress task to resume until its predecessor complete. Fig-1 (Foundation work begins as the work front available, but it is not allowed to start remaining work until piling work complete on the remaining piles). Industry standard specification most often required the “Retained Logic” option and considered as best practice. Owner organization favors “Retained Logic” as this option produce the worst case scenario forecast completion date which signals early warning that help to expedite Contractors to catch up the plan. It signals the Scheduler to be aware of what is happening on the ground rather than sitting in front of desk. Therefore, Scheduler has an opportunity to find out why the agreed logic are not being followed. This can sometimes produce unrealistic schedule when out of sequence progress occurs and result in inaccurate information and artificially delayed the project. This could mislead to send the wrong message to the project team that forecast project completion date is far behind the baseline if the Scheduler isn't aware the changes of critical path activities and/or due to out of sequence activities. 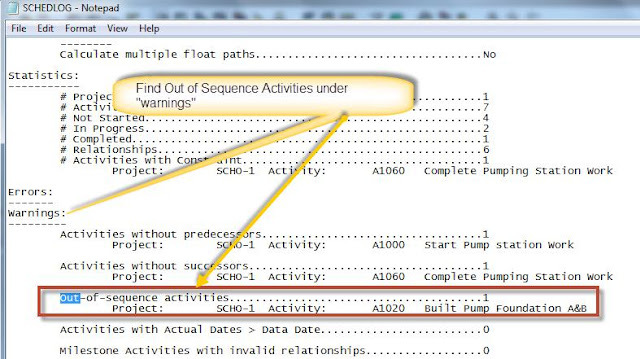 As Primavera respect CPM (Critical Path Method) rule that require the correct information and the appropriate logic to forecast a realistic completion date, it may be difficult to use in the generic activity of works. It requires lot of experiences and knowledge, the details information of scope and time in order to design the schedule activity and logical sequences. Scheduler will be busy with fixing logic to reflect the actual sequence in the field or contractor’s current activity sequence, seeking stakeholders’ agreement and documenting the changes. However, this could be on the advantage side if the effort spent is worth. For example, correct the logic of the critical and high risk activities (if they became out of sequence activities) that have been agreed in the estimated schedule assurance review and schedule risk assessment. It is advantageous to run what if scenario especially when total float is analysed. It is a quick way to check for Out-of-Sequence activity. The changes made in the field can be observed. 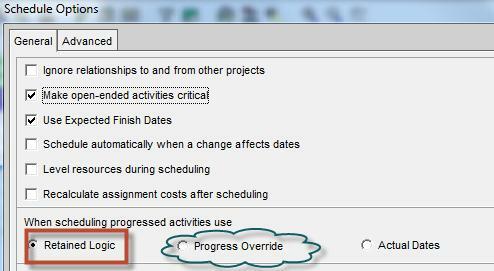 That means if the project end date is shorten significantly when scheduling option is switched to Progress Override, you may have a lot of work to do. It indicates there is a lot of critical out of sequence works to be corrected. It might be advantageous to use this option as it will more accurately reflect actual work done if a sufficient detailed schedule is being used. However, this may be highly risky as generating perfect logic is very difficult to achieve in real world. It will be advantageous to use progress override for the Contractor which they can try to present the Client that project is in good shape by hiding delays. It also acts as a good comparison tools to identity the individual out of sequence activity against the Retained Logic option. That means you can compare the individual activity that shows as continuity (not showing non-working duration) while using progress override against the activity which is shown as the split activity (showing non-working duration) while using Retained Logic. See Fig.1 as above and Fig.2 as below. The expected forecast completion will be more optimistic and hide delays more often as this method ignores predecessor relationships and allow the progressed activity that can be forecasted to be completed before its predecessor finish (See Fig.2). It may never be shown up on the critical path or nearly critical path as there is no relationship linked to identify its criticality. This is risky as this could mislead to send the wrong message that project could finish earlier than possible completion date if scheduler isn't aware this is due to out of sequences activities. It is also essential to revisit the logic and correct as necessary if the unrealistic result is shown. For example; the “Excessive Free Floats” are found or project completion date is shorten significantly. This could also be on the advantage side if the effort spent in fixing the logic is worth as the changes made in schedule that project team believes that is achievable and make sense to them. How to change schedule calculation setting to Retained Logic or Progress Override?? Step-1 Go to Tools on the menu bar, click “Schedule” or Press F9. Step-3 Choose the prefer option either Retained Logic or Progress Override. Why Out of sequence activity occurs?? As the result of uncompleted engineering design/constructability study or rough estimation of activity duration, activity description/name could lead to design generic activity name and longer duration. (I.e. level 2 activities instead of level 3 or 4). As the contractor is doing everything possible to achieve more progress when the project is under way although the appropriate logical sequence has been agreed when the baseline schedule is being developed. For example; Construction work may start before engineering design 100% complete although everyone agreed to start onsite construction only after 100% design work is done during schedule development. This could be as the result of Client forced to start Contractor as engineering design is already delayed for several weeks and taking the calculated risk of reworks due to uncompleted engineering works. Another reason is that Contractor chooses to start any works where work fronts are available so as to earn a steady progress. How to find the out of sequence activity?? Out of sequence activity can be observed using Gantt chart (Fig.1 & 2) and Schedule log. 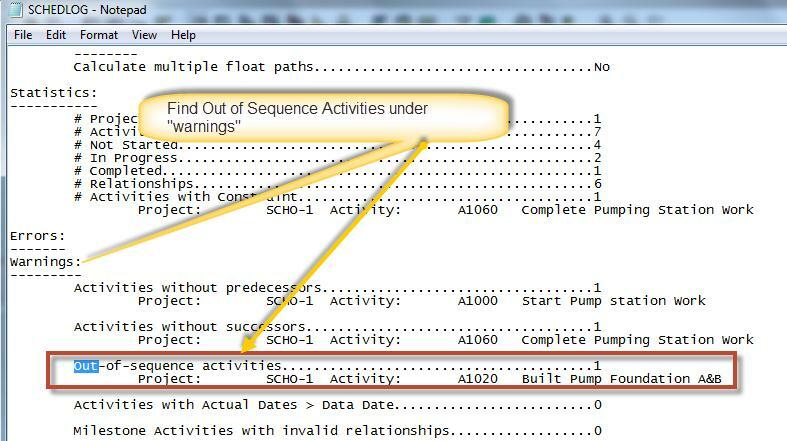 Step-3 Find the out of sequence activities under warnings section in schedule log notepad. If there is a significant amount of in-progress activities with out-of-sequence, consider revising logic according to change management procedures and then update the most current baseline to reflect the changes. Any modification in the schedule may make a schedule unsuitable for comparison with the baseline if the baseline isn't updated accordingly which make progress monitoring difficult. I prefer to use Retained Logic most of the time as it predicts the worst case scenario outcome that give me the opportunity to the find the gap between the plan and actual sequences. That could also help to bring the discussion on to the table so as to resolve the issue as soon as possible or identity new risks and opportunities. I also use Progress Override option to find out the difference between two options and take the corrective action as necessary. Do you have any other advantages and disadvantages of each option? Share with us in the comment section. Hi there, recently we have submitted our (Contractor) delay analysis to the Client using the retained logic. But the client has rejected our method and is using the progress override thus reducing our claim for extension by 14 months...in this scenario what do u suggest? (1) Scheduling method (Retained Logic) have been proposed and agreed with Client during bidding process. If this has not been spelled out in the contract, you may also explain this method is Primavera default option and best practice to forecast a realistic project completion date. AACE International Recommended Practice No. 49R-06, "recommends the use of retained logic CPM calculation mode due to the fact that logic override can create orphaned predecessor activities and disregards listed constraints. If the retained logic method produces poor or inaccurate results, then the logic of the network should be corrected and not the CPM calculation mode". (2) Revisit activity sequence and correct to reflect current work flow as per Change management Procedure.